Most people are familiar with the parable of “The Prodigal Son.” In it, a young man asks for his inheritance early and ends up squandering it, only to come back and beg for forgiveness from his father. This story helps illustrates a surprisingly common modern trend in American financial planning. Sixty percent of family wealth is squandered due to lack of communication and trust. Your clients work, not only to provide for themselves and their family while they are alive, but also to pass down their earnings to their children and leave them with some semblance of generational wealth. This is a noble endeavor and as your clients’ financial advisor, you should be similarly concerned with multi-generational financial planning. Families can sometimes be a challenging topic to approach as an advisor. Every family interacts differently and every client most likely has plans on who in their family will get what. While it’s not your place to direct these decisions, you should be working to include children in the financial planning process. Ask your clients if they would like to include their children in the planning process. If they are reticent, encourage them to take the long view and think about how their children will be involved in their lives in a decade or two. Often times, many caretaking duties, at least to some degree, fall to the children. This makes them a critical component in planning for your clients’ futures – both for your client and their children. If you get to know their children (or designated financial recipients), ask permission (from both parties) to set up a private meeting with them at a later date. This meeting can be high-level in nature just to get a feel for the plans those children have for their parents’ wealth. It doesn’t have to be intrusive and you shouldn’t try and steal clients from another advisor, but rather approach it looking to find there is at least some financial planning in place when they receive these funds. As long as no confidential information is shared, you can report back to your clients what you think the status of their wealth will be once it is passed down. You can then encourage conversations between the two parties if a plan is not in place. While ensuring a financial legacy is in place may seem necessary for the mass-affluent, it’s actually important for all of your clients. Kathryn Swain, Director of Wealth Solutions at BNY Mellon’s Pershing, agrees. 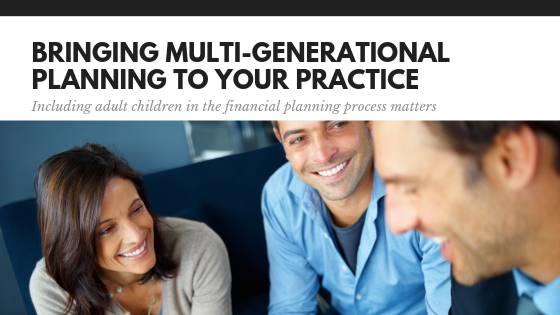 Multi-generational planning can be tricky given the dynamics of many families, but as long as you approach the topic sincerely and with tact, most people will be open to talking about finances. There will be uncomfortable meetings – that’s a given – but your clients will benefit in the long-run and hopefully their wealth will be preserved to benefit future generations. Not only does including the whole family ensure your clients and their children are taken care of, it also improves overall communication and relationship-building with your clients. Close to 70 percent of widows take their money to another advisor after their spouse passes, but if you build a relationship with the spouse and their family, you’ll reduce that churn significantly and see an increase in AUM.